We've made pho one time before this, but perhaps it was PB (pre-blog). In any case, we didn't document it. Some time ago, we saw that oxtails were on special and decided that it was high time we made pho again. This time, I'm applying what I learned from the previous attempt. Then and now, we used the recipe from Pleasures of the Vietnamese Table by Mai Pham as a guide. The first step in making the broth was charring ginger and onion. So cool. These pictures aren't really step-by-step, but the charring was so fun I had to take pictures. Here are the charred ginger and onion waiting to go into the broth. The recipe called for beef bones and beef chuck to make the broth, but we decided to just use oxtail. 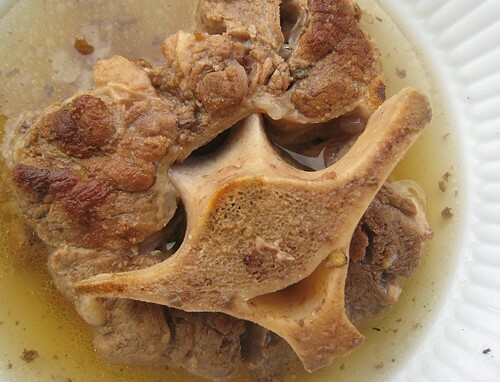 The oxtail pieces were "cleaned" first by plunging them in boiling water until their exterior changed color. Then they went into pot with new water and brought to a boil, then simmered. In went the charred ginger and onions, some fish sauce and sugar. This simmered for about two hours. Of course, one's supposed to skim this simmering liquid to get rid of any scum. Anyway, after the 2 hours, I added the spices: star anise and cloves. According to the book, the spices are simmered in the broth for only 30 minutes. But I left them in there for longer because I really like star anise-y pho. I believe we basically just left that pot to simmer for quite a while. I remember just turning it off before going to bed. The next day, we brought the broth up to heat and removed the spices, onions and ginger. I seasoned it with salt and fish sauce until a little salty (because the noodles will balance it out) and added a little ginger to "freshen" it up. The broth was basically done. I learned my lesson here! I soaked some dried rice noodles in cold water for 30 minutes -- not 1 minute more! -- and drained them. To cook, I placed small batches of noodles into boiling water until just cooked. I was afraid of them being soggy again. They were perfect this time. To serve, place cooked noodles in your bowl, add some oxtail pieces and thinly-sliced sirloin beef. Pour boiling broth over. (Yes, I had to bring the broth to a rolling boil; it wasn't just hot.) Add other garnishes as desired. For me, the sliced onions, cilantro, Thai basil and peppers are a must. Oh, and lime juice and black pepper too. I don't like adding hoisin as a condiment. I want to focus on the broth. Ah, pho. So good. I don't think I even need to describe how good it tastes. I want some now! 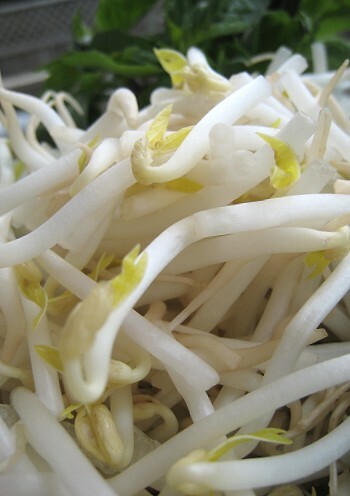 For more information on pho and an actual recipe, visit Pho Bo at Wandering Chopsticks. Pho recipe used is from Pleasures of the Vietnamese Table by Mai Pham. Oh wow does that look wonderful! Matt loves pho I should really make it for him. That looks pho bo-lous! hehe sorry, can't help it! I don't like to add hoisin either, yup it's all about the broth. The charring pics won me! 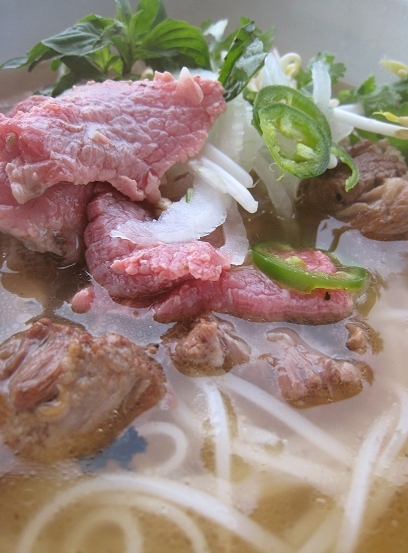 Have you tried star anise in Pho? It's my favourite flavouring. Looks great! 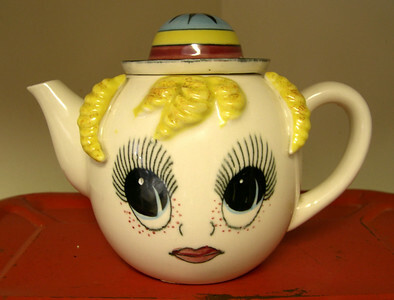 I could so use this on such a gloomy day. Imagine. A gloomy day in SoCal! No cinnamon though? I add a few sticks to mine. I didn't know that charred ginger and onion went into a pho broth. That explains a lot as I guess there's more to it than just star anise. 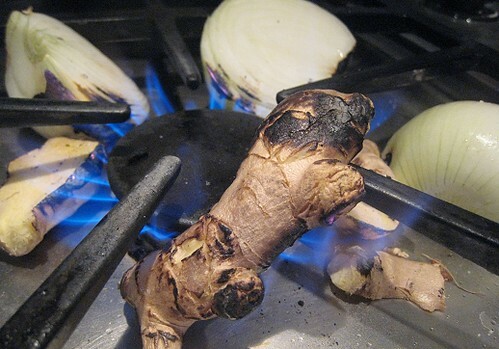 I've never seen ginger being charred! I love pho broth, but can never duplicate it at home. pho with oxtails...I love it! gonna try it when we make our pho using the Vietnamese cinnamon we got from White on Rice Couple. I've never had pho. Ever. I feel like I need to go to the Asian grocery & get some. Your broth sounds amazing. 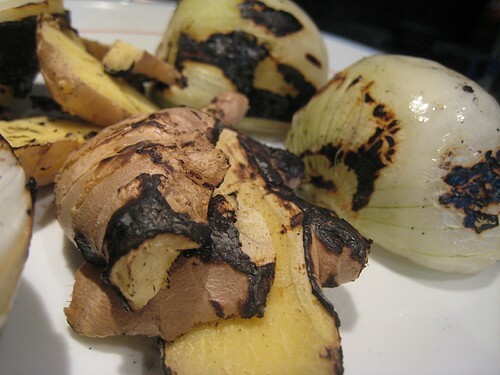 Charred ginger & onions....great base. I bet they really set it off. This looks good - and you know what? I was just thinking to myself that it's time for me to go back to my favorite Thai-like restaurant for some of this type of soup....the irony! Looks great! I'm going to Vietnam in a few weeks, and this post is getting me even more excited than I already am!!! I LOVE pho! Yours looks absolutely wonderful. 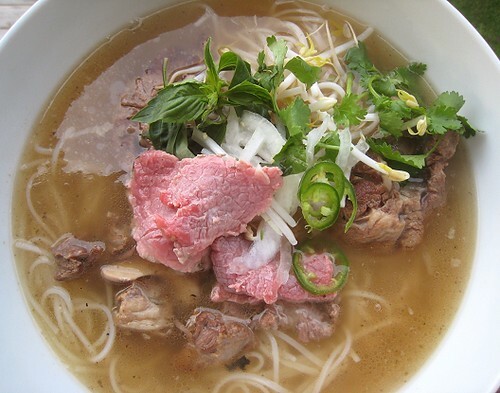 Mmm - pho is my favorite soup in the winter! I love this stuff but it's so much work and ingredients to deal with. You make it looks so easy. Looks perfect. Nice job with the charred ginger and onions. I love pho and I'm so disappointed that the pho in restaurants isn't that good here. I really need to try making it! Thanks!! Hahahaha, Pho bo-lous. I didn't realize how close it sounded to fabulous... Teehee. Oh! Cinnamon! I didn't even think of it at the time. The recipe in the book didn't have it. Will do that next time. We didn't know all those things went into it too. All we knew was the star anise. "...using the Vietnamese cinnamon we got from White on Rice Couple." 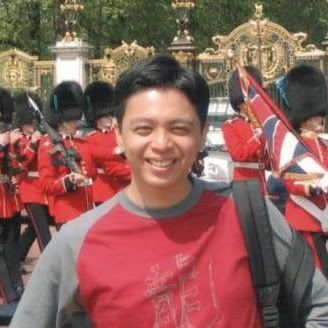 Wow, Hi Ben! Never seen you around these parts before. Hehehe... I think a little MSG wouldn't hurt at all. ;) We don't have it in the house, though. Do you think it has a chance to win even though it has no pageant experience? You should make it at home! It really is quite delicious. Ooh, the food possibilities there! Have a great trip! That looks so fresh and good! I like all of the green and white garnishes. i need to try it more often at home... in fact, maybe i will go to the store and give it a shot today, thanks for the idea, eatingclubvancouver! 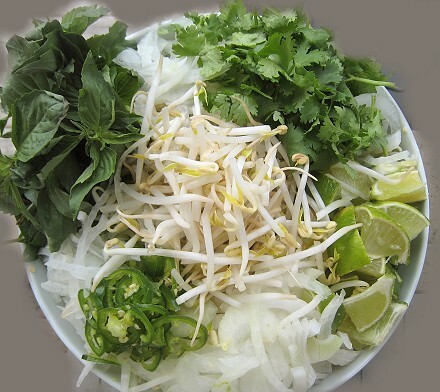 Pho always hits the spot because it's so rich in flavor, yet light and fresh at the same time! I've been craving pho for a while now. Yours looks wonderful! This soup looks like a winner to me. My husband will NOT eat in an Asian restaurant, but he loves most Asian soups. I am pretty sure he will like this one. Looks really delicious! I love pho! I should definitely give this a try! Do! Do give it a try. Hi there, I have finally made mine last night. So yummy, worth the time making the soup. 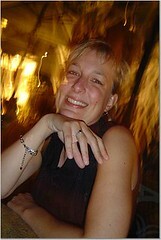 Yours is lovely and lovely picture!!! We saw yours too. Pho for dinner can never be wrong!